Staying at the forefront of research requires access to the most advanced equipment and infrastructure. We move quickly to keep our scientists at the cutting-edge. 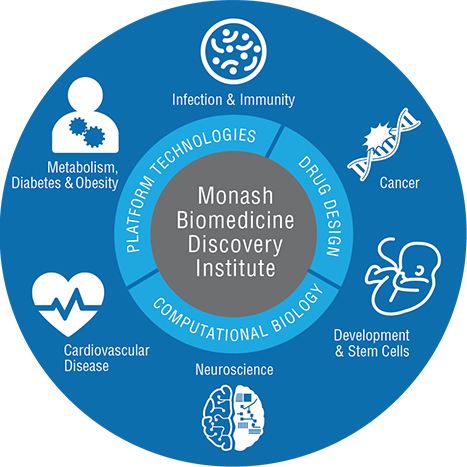 At the Monash BDI, our research capability is greatly enhanced by the Monash Technology Research Platforms. Monash’s integrated and professionally managed research infrastructure is a key pillar supporting the Monash research strategy and a differentiating feature of our research environment. The platform network brings together leading researchers from different fields to engage with local, national, and global, academic and commercial research sectors. Coupled with certification from the International Organization for Standardization (ISO9001), these platforms are a game-changer for academic industry collaborations. For more information, visit the Monash Technology Research Platforms site. For a linked list of our platforms, click here.